Heat transfer is required in many processes in the food and beverage industry, for example, cooking, sterilising or freezing. However, food and beverage processing is a highly regulated industry and businesses must protect consumers from any hazardous products that can contaminate the product. So, when selecting a heat transfer fluid for a facility, food manufacturers should be careful to choose one that will not compromise the quality of the product or affect consumer safety. Does heat transfer fluid impact food production? Recalls of food and beverage products due to contamination concerns have risen significantly over the last decade. If food and beverage manufacturers use a standard heat transfer fluid and there is incidental contact with the product, the whole batch will have to be scrapped. It can be costly to dispose of products and can damage a company’s reputation if the product has to be recalled. Manufacturers should consider how they can improve customer safety by selecting the correct heat transfer fluid for a food processing facility. In any environment where a thermal fluid may come into contact with a consumable product, such as food or drinks, manufacturers should look at NSF HT1 certified food-grade fluids. Why use a food grade fluid? If manufacturers use a food grade thermal fluid, any incidental contact with the product or a preparation surface will not result in contamination and disposal of valuable products. 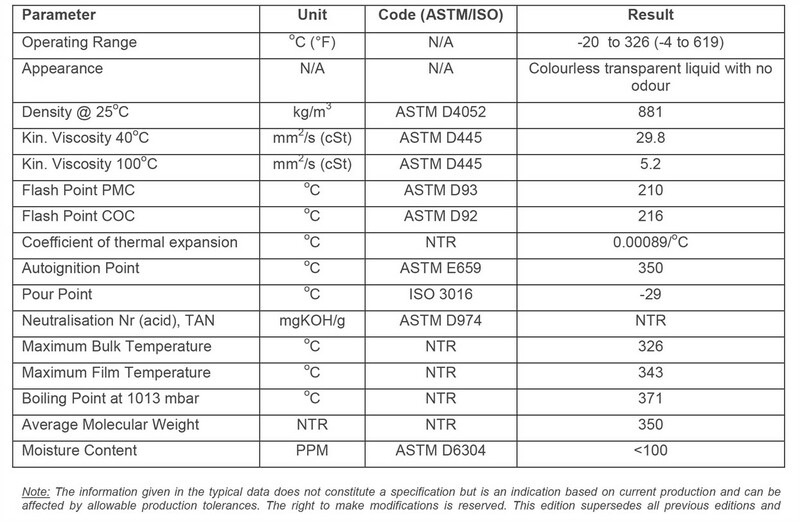 What are the thermal fluid regulations? Any manufacturer that has a heat transfer system will have to adhere to standards and regulations. This is particularly true for food manufacturers because they must adhere to food-grade standards (in the UK this would be British Retail Consortium (BRC) standards) in order to sell their products to supermarkets. The Dangerous Substances and Explosive Atmospheres Regulations (DSEAR) and the Explosive Atmosphere Directive (ATEX 137) outline the mandatory requirements for minimising safety risks and protecting workers from fire and the explosion of flammable materials present at the facility. Are there specific fluid regulations for food? The DSEAR and ATEX regulations apply to every industry that uses heat transfer. Food and beverage manufacturers must also adhere to regulations specific to their application. Heat transfer fluids that are specifically manufactured for food processing must be fully H1 or HT1 certified as a food grade thermal fluid by the US Food and Drug Administration (FDA) and the NSF International. The distribution of food grade thermal oils is highly regulated in Europe and companies must comply with Registration, Evaluation, Authorisation and Restriction of Chemicals (REACH) and CLP regulations. These refer to the classification labelling and packaging of substances. What is a food grade thermal fluid? High quality food grade fluid is non-hazardous, non-toxic and odourless, which means it requires no special handling and is not considered a controlled substance under United States Occupational Safety & Health Administration (OSHA), Canadian WHMIS Workplace Hazardous Materials Information System (WHMIS) or other workplace regulations. Global Heat Transfer has worked with food manufacturers for over 25 years to develop a thermal fluid that can best suit food processing applications. Globaltherm® FG is a food grade thermal fluid manufactured specifically for food and beverage product manufacturers. This is a highly efficient non-fouling NSF HT-1, FDA and USDA-Certified food grade heat transfer fluid specified for use in food processing and other applications where the product is intended for human consumption, such as pharmaceuticals. Globaltherm® FG thermal fluid is developed for indirectly heated, liquid phase heat transfer systems that require bulk temperatures of up to 326 degrees. It is non-hazardous, non-toxic and odourless and also has outstanding thermal oxidation stability, allowing operation at high temperatures for extended periods. Will food grade fluid degrade? Food manufacturers should invest in food grade thermal oils as they have a strong resistance to fouling, slowing their degradation. All HTFs degrade over time because they have to operate at high temperatures for extended periods of time. At these temperatures, the bonds that exist between hydrocarbon chains will start to break and form shorter (commonly referred to as ‘light-ends’) and longer chained hydrocarbons (‘heavy-ends’). The build-up of light-end components is a potential fire risk because they decrease the ignition temperature of the HTF. The accumulation of heavy-ends results in the formation of sticky carbon deposits or sludge and can be monitored by analysing the carbon residue in a system. How can I maintain food grade fluid? If a system is not properly maintained or checked regularly it will impact the product, for example a food product may be cooked inconsistently or pharmaceutical product may not blend properly. At this stage, the fluid has degraded, must be removed and flushed from the system and replaced, causing expensive downtime and additional CapEx costs, both of which could be avoided with a proactive and preventative maintenance programme. You can extend the life of your food-grade fluid with help from Global Heat Transfer’s preventative maintenance programme, Thermocare. Taking samples every quarter allows you to spot any changes in the fluid and react, before it impacts the product. To get a representative sample, manufacturers must take a hot, closed sample. This is the only way to understand the condition of the fluid when it is moving around the system. 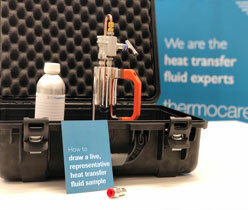 Have you got more questions about food-grade heat transfer fluid? Give us a call for more personalised advice on 01785 760 555 or you can visit our contact page for any enquiries. Made from severely hydro-treated base stocks, Globaltherm® FG thermal fluid has outstanding thermal oxidation stability allowing operation at high temperatures for extended periods. It is non-hazardous, non-toxic, water white and odourless. Highly efficient non-fouling NSF HT-1, FDA and USDA-Certified food grade heat transfer fluid is specified in a broad variety of industrial process applications in addition to food processing. Globaltherm® FG thermal fluid is a high efficiency heat transfer fluid specifically developed for non-pressurised, indirectly heated, liquid phase heat transfer systems found in food processing plants, pharmaceutical operations and other “food grade” applications that require bulk temperatures up to 326°C (619°F). FG is a mixture of exceptionally pure HT hydrocracked base oils. Globaltherm® FG thermal fluid is non-hazardous, non-toxic and odourless which means it requires no special handling and is not considered a “controlled substance” under United States OSHA, Canadian WHMIS or other work place regulations.